As a ‘literal’ being I misread at first stab ‘Curried oysters dipped in corn mother….’ and wondered who ‘Corn Mother’ was. There’s is little hope for me if the truth be told – the wife often says that. Guap!! Hi!! HA! I know it’s pretty tacky starting Christmas before Halloween even. Maybe they should combine all three holidays — HallowThXmas! And we’ll all go home on September 30 and come back on Jan. 1. They couldn’t – think of the leftovers!!!! I think you should print out your poem and send them out as Christmas cards this year. I also request a Halloween poem next! I’m dreaming of a WIDE Christmas for those of us well-fed. I’m with Jackie on the Halloween poem, but first I want one for Columbus Day. As I recall you did a nice piece on him once already. Didn’t he land in Ohio? Oh Columbus day is fast approaching. I’ve lost my Columbus day calendar that has little Nina, Pinta and Santa Maria doors you open revealing who got scurvy each day until they landed in the West Indies. Darn!! I did so love that calendar! I’m dreaming of a Wide Christmas too!! I think that would make a great Christmas Card, Russell! HA! That was The Jolliest Christmas Poem Ever!!! I’m gonna be dreaming of curried oysters dipped in corn, till I wake up inna morn!! Then I’m gonna have some for breakfast, along with a big bowl of red and green Funyuns!! 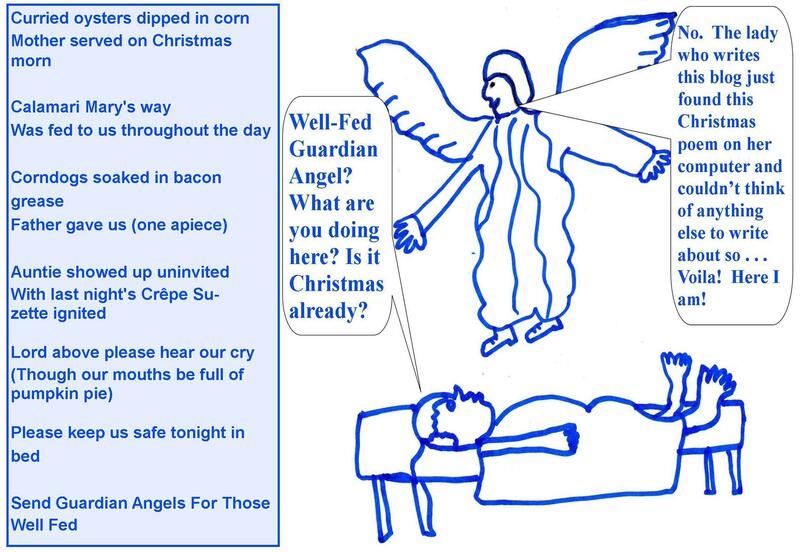 And I loved the guardian angel who’s hovering ominously over the poor guy’s full stomach. As for the poor beddy-bye guy’s feet, they are colossal and glorious in the best possible way!! Oh Mark, funny I always did take you for a curried oysters dipped in corn kind of guy! And really what could go better with it than a big bowl of red and green Funyuns! (I may have to write Al and tell him about that. If anyone can get ‘er done, it would be our beloved Al!) I’m so glad you liked his feet. I must have been inspired — perhaps I was channeling Al Gore’s feet. Thank you so much Mark, you always make me think! !